2.5mm Finemesh super stretchy neoprene peaked / visor surf cap – hat – hood. Velcro chin strap fixing for an easy fit – one size fits 99% of people. Made from high quality SCR skin neoprene (really warm). Double glued and blind stitched with VELCRO side closure for easy on and off (plus adjustable tightness of fitting). Most your body heat is loss via your head – not anymore with one of these caps. 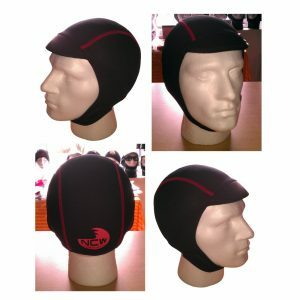 These wetsuit caps are made for cool waters (like the ours here in the UK).